It was a trip to San Francisco that gave me the good fortune to hear, in person, the director of the new film, 99 Homes.Ramin Bahrani talked about how much on-scene research he and his crew did prior to finishing up the script and shooting this excellent movie about how real events in the real estate game can get so dirty. Bahrani said many points made in 99 Homes were drawn from genuine experiences of home owners in a regional housing bust in Florida. Applying fictional characters to these actual incidents, Bahrani offers a moving and --- at times --- hard-nosed thriller about a single father, his mother and his son being evicted from the home they've lived in for several years. Andrew Garfield plays Dennis Nash, an unemployed construction worker who's fallen far behind in his mortgage payments to a local bank. Laura Dern has the part of Nash's mother and Noah Lomax is cast as the young son. 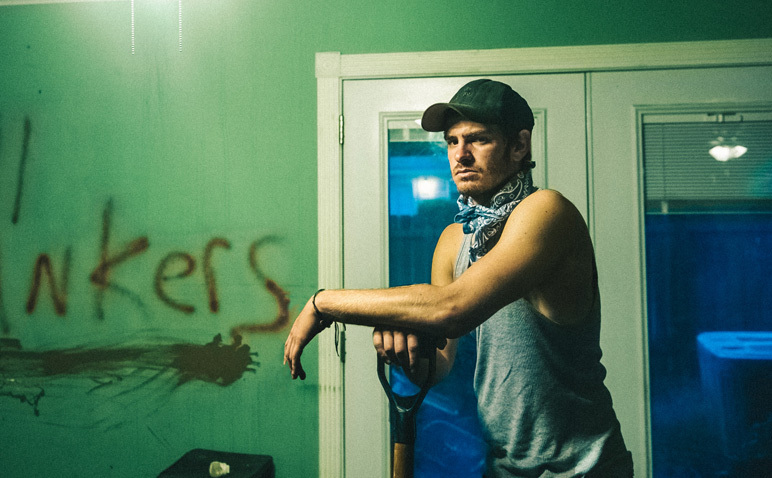 The curious twist in 99 Homes comes early in the film after Nash's family has had to resort to renting a cheap motel room that's nearly overrun with other such families as the Nash's; all evicted and living on the edge … scraping by. Michael Shannon, soon to be seen in another new film called Freeheld, plays the part of Rick Carver, a heartless real estate agent who makes a killing off repossessed homes. Shannon is perfect for such a heavy role. It will be difficult for you to not sense some hate for Rick's character. Now more on that twist, as well as irony. Dennis is so distraught about losing his home … and so destitute … that he hires on with Rick to refurbish homes that Carver's agency has acquired at a much lower cost. Dennis' plan is to make enough money to get his house back from Carver. Dennis doesn't make a deal with Rick for great knowledge and power as Faust did, he just wants his home back. It doesn't sound exciting and not at all thrilling that such a plot could hold your attention, but it most certainly does. Fine acting, and a solid script stoke 99 Homes with a stunning punch while giving you a revealing look at the games people play with real estate and how handy the Federal National Mortgage Association (Fannie Mae) can be for unscrupulous people in the home sales biz. Again, this is a fictional drama messaging authentic, shady games much like film director John Sayles did with his 2002 movie, Sunshine State: good drama with a purposeful intent. Good for Ramin Bahrani. Bahrani, an American-Iranian, won high praise from the late Roger Ebert for one of his earlier films: Chop Shop. Ebert put Chop Shop in 6th position for the best films of the 2000 decade. Bahrani is a professor of film directing at Columbia University and has dedicated 99 Homes in Ebert's memory. Michael Shannon has a significant part in the soon-to-open film I mentioned: Freeheld, starring Julianne Moore and Ellen Page. I've seen it. A review of Freeheld comes with its open. Shannon's other excellent performances are parts in HBO's Boardwalk Empire, Mud, The Iceman and the quite creepy, but fine 2011 feature, Take Shelter with Jessica Chastain. I recently saw it again --- another good turn and in the lead, as well, given by Shannon in that one. He, as Bahrani, doesn't disappoint.